As you can see, the new design went live, congratulations on the official launch! 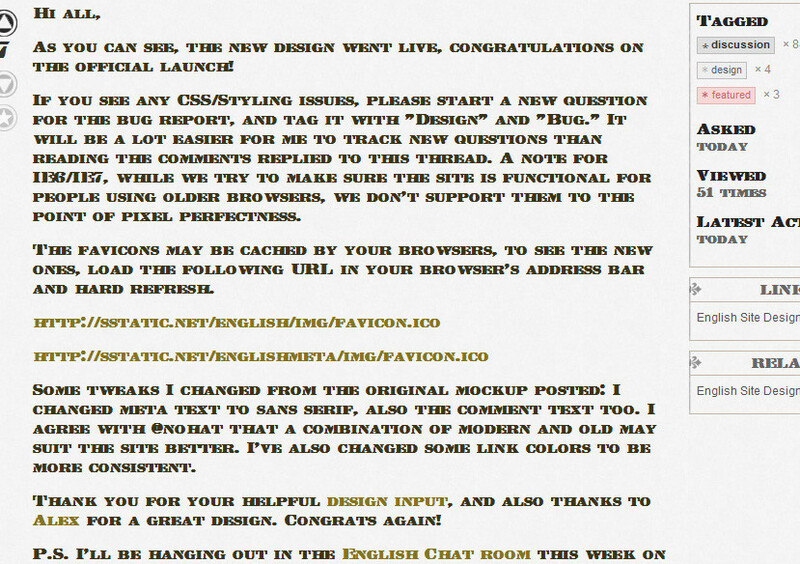 If you see any CSS/Styling issues, please start a new question for the bug report, and tag it with "Design" and "Bug." It will be a lot easier for me to track new questions than reading the comments replied to this thread. A note for IE6/IE7, while we try to make sure the site is functional for people using older browsers, we don't support them to the point of pixel perfectness. The favicons may be cached by your browsers, to see the new ones, load the following URL in your browser's address bar and hard refresh. Some tweaks I changed from the original mockup posted: I changed meta text to sans serif, also the comment text too. I agree with @nohat that a combination of modern and old may suit the site better. I've also changed some link colors to be more consistent. Thank you for your helpful design input, and also thanks to Alex for a great design. Congrats again! P.S. I'll be hanging out in the English Chat room this week on and off. Feel free to send me feedback there too(although I still prefer bug reports to be posted here on Meta). The English chat room's theme design has been updated as well. I would request a minor change: the "accepted" checkmark does not contrast enough with the accept-trigger-checkmark (the checkmark you click on to mark an answer as accepted). On my LCD screen, and with my minor colour-blindness, these two are indistinguishable. I think the "accepted" mark should stand out more, either by being a brighter colour or a darker shade. A little late to the game, here, but I love the new design! Any chance of getting a typeface for questions that isn't quite so hard to read? The extreme contrast between heavy and lightweight strokes produces pretty bad aliasing and jagged edges at 1024x768. I'm sure an antique-y font was chosen for the aesthetic it provides, but it is impacting readability. EDIT: ClearType fixes the issue. Thanks for the pointer! Otherwise, thanks for the great work! I love the font used in the comments, and Georgia is really a stain for the eyes (in my personal opinion) and it does kind of go against proper English use when everything is capitalised. I'd love to see that change, but I might be the only one.. I thoroughly enjoy how heavy handed usage of the quotation tick results in a rather garish, visually frightening answer/question.